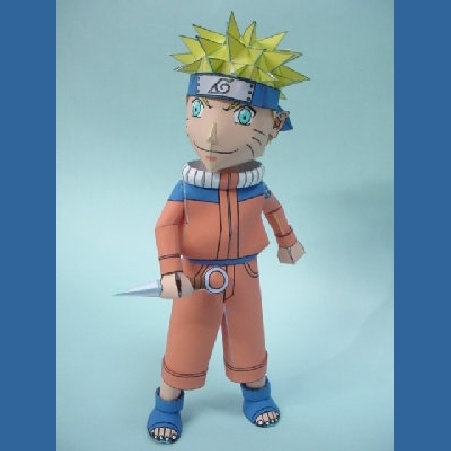 This Naruto paper model is a nice change of pace in that it was created from scratch rather than being based on a 3D model ripped from a video game like most papercraft figures are these days. I especially like the ornery look on Naruto's face. ^^ The papercraft template for this model may be downloaded here. Also available are the Naruto characters Sakura and Sasuke. 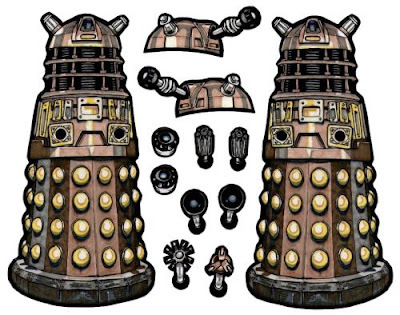 On the one hand, the idea of Dalek paper dolls seems a little absurd, but on the other hand there is something about them I find a little amusing. 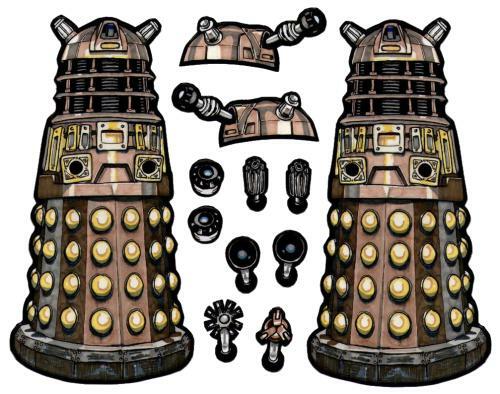 These well executed Dalek paper dolls are the creation of DeviantART member, MadunTwo-Swords. The dolls may be downloaded here. Madun also offers many other Doctor Who cutouts to amaze and delight. Zoids began in the early 80's as a toy line introduced by the Japanese toy company, Tomy. Since that time the franchise has grown to include TV shows, video games and manga. Zoids are living robotic war machines modeled after various animals. 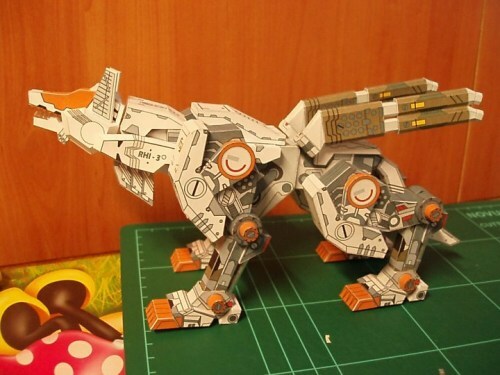 This papercraft Command Wolf Zoid is the fan art creation of Imam Sujugo. PDF and Pepakrua PDO templates for the model may be downloaded here. One of the most memorable characters from the animated film, My Neighbor Totoro is the Catbus, a enormous grinning cat whose hollow body serves as a bus. 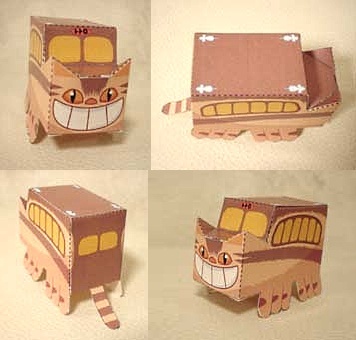 This Catbus paper toy was created a work of fan art by Totoro enthusiast, Hiyochico. 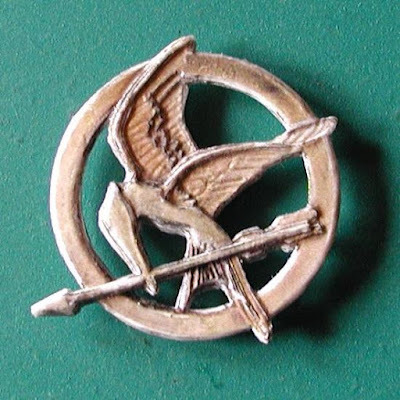 A PDF file for the toy may be downloaded here. A more sculptural paper model of the Catbus was previously posted here. Word has it that the six-legged sky bison on Avatar the Last Airbender was modeled after the Catbus! 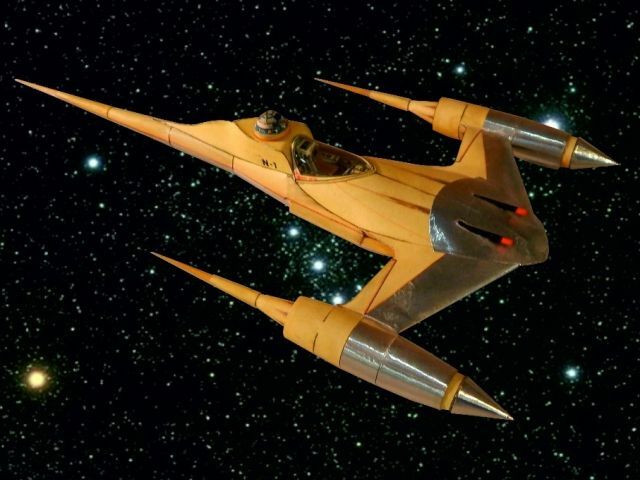 In the final battle scene in Star Wars: Episode 1, the inhabitants of Naboo make use of bright yellow N-1 starfighters to defend their planet. This 1:60 scale paper model of a Naboo starfighter was created by Czech designer, BaJ. 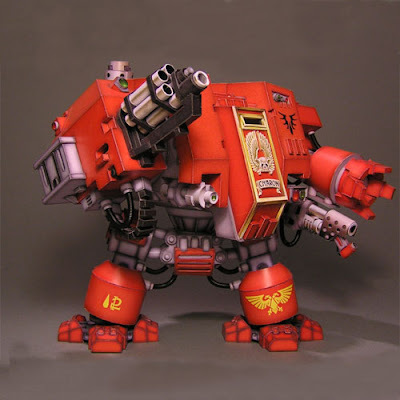 I like the fact the template for the model is hand drawn. It reminds me a lot of the paper model patterns that were published in the old ABC Magazine (a Czech publication for children). The instructions for the model detail how to glue foil to the front of the starfighter to give the metallic look it has in the photo. A PDF download of the starfighter is available here. Many of us were saddened by the passing of musician David Bowie this week. 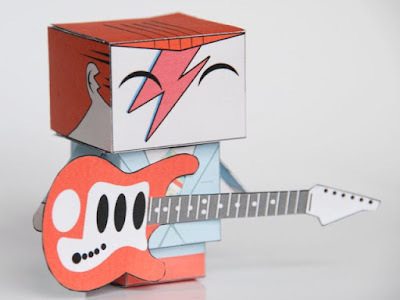 As a tribute to Bowie, DeviantART member Scarykurt created a paper toy entitled "Love you Bowie". 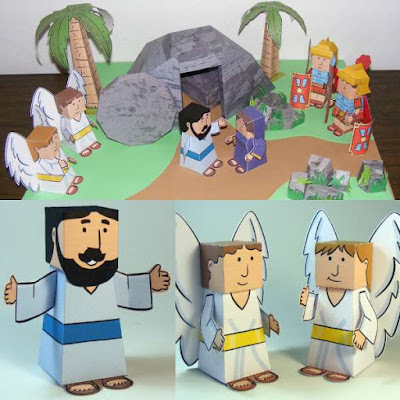 The toy is based on the cubee method of paper toy construction, so no glue is required. The JPG template for the toy is available for download here. Rest in peace Major Tom! What were tabletop RPG games like before papercraft was introduced? A lot less fun, I'd say. :) Eddnic at Fantasy Paper Miniature runs one of the best websites for free 2.5D printables for miniature gaming. 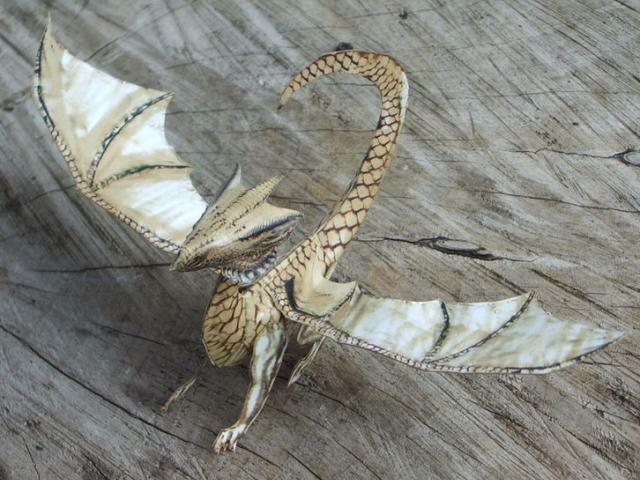 This white dragon is but one example of his work. The template for the dragon may be downloaded here. Build photo by DeviatART member Cavyman. Ray at Ravensblight is the undisputed master of "haunted" papercraft. The list of haunted paper models he has created includes houses, mansions, ships, cars, a chapel, a train, and a carousel! 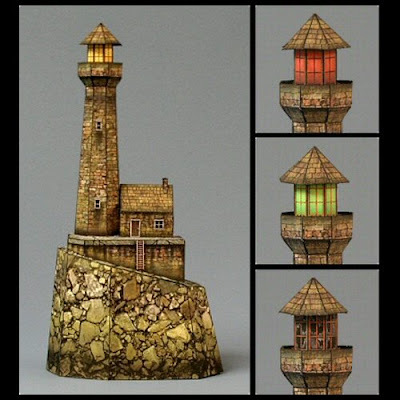 This papercraft lighthouse, however, is my favorite to date. The PDF template for the model may be downloaded here. In a 1966 episode of the original Star Trek TV show ("Where No Man Has Gone Before"), Captain Kirk can be seen toting a somewhat odd looking rifle. For those of us who are fond of such retro sci-fi weapons, Perry's Paper offers a free 1/3 scale printable paper model of the gun. 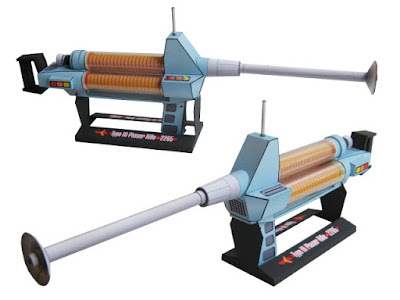 In the Star Trek universe, the technical name for such a gun is a "type 3 phaser", but in most cases it is referred to simply as a "phaser rifle".